Really quick before we get into the pictures. I just want to be sure you all have seen the Podcast I started a few weeks ago. This is a daily show about all things related to automotive service. We talk about being a tech, car maintenance, being a good customer, finding the right tech, and on and on. This is really meant to bring the customer and the technician back on the same page. The more we understand each other, the better everyone’s experience will be. One last thing about the Automotive Podcast. I am working on stripping the audio and making an audio only version. That way if you want to listen while you are driving, it is no hassle at all. I am really a podcast fan, so this should be awesome. Okay, let’s do some Shop Shots! First up we have a horrible tire repair. This is a plug that was done basically in the sidewall of the tire. If you look in the red circle, you can see the plug. Then you can see how chunks of the tire are coming off. There is a lot of flex in that area of the tire. This position makes for a very dangerous repair. 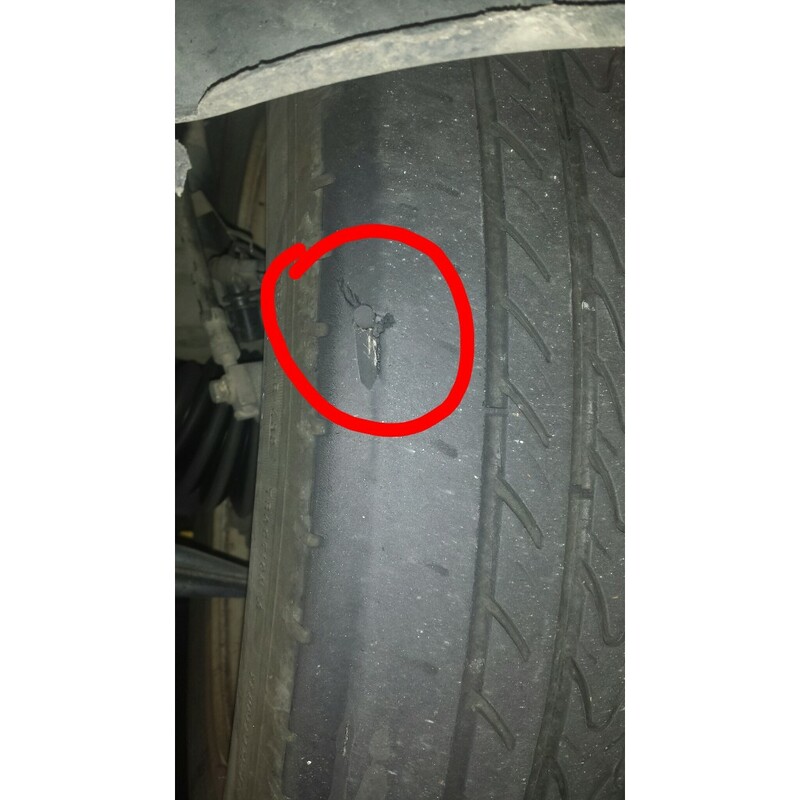 This is one reason why many tire shops will not patch or plug a tire in that location. Next up is an issue that plagues Beetle Headlights. That plague is front end damage on 1998-2010 VW Beetles. The problem comes when either a Beetle has damage, or a headlight is not installed properly. This makes installing the headlight extremely difficult. 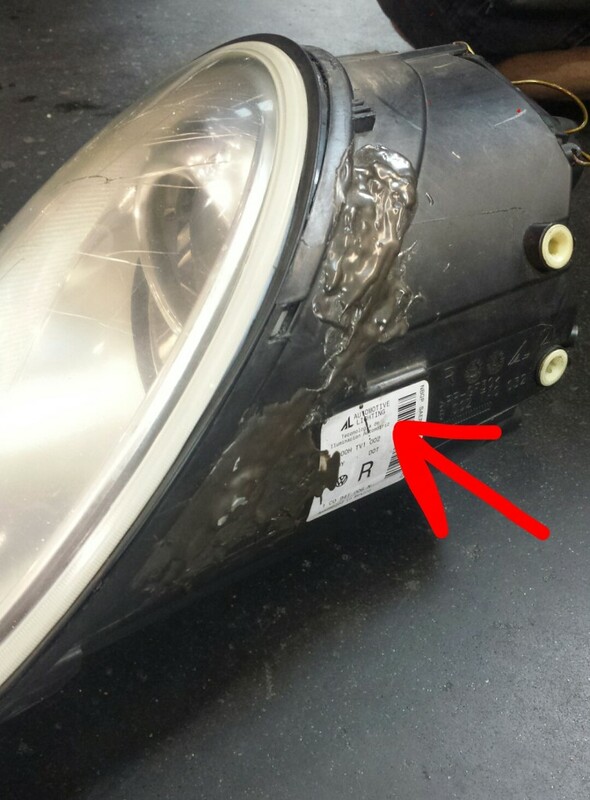 In this case, someone or something damaged the headlight in a way that it should have been replaced. As you can see, it was not replaced. It was epoxied back together. 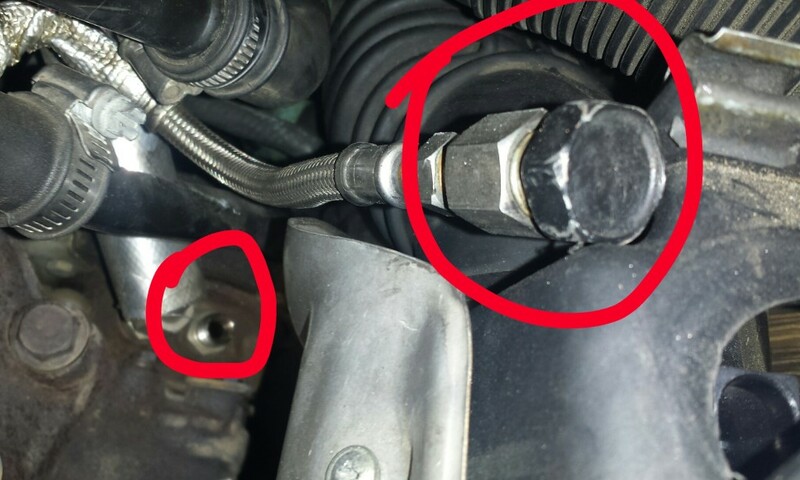 This may have solved the issue of water leaking into the headlight. It did not solve the, it’s a pain to properly install issue. Last up is something that I have never seen before, and I have seen some CRAZY stuff. This 1.8t Passat got towed in. Another shop told them they needed an engine computer. The tech looking at it called me over to check this out. The top red circle is the line that supplies oil to the turbocharger. This both cools and lubricates one of the hottest parts of the engine. For sum reason, that line is blocked off. That means the turbo is getting NO FREAKING OIL! Why? WHY? WHY???? I don’t understand why this would be a thing. It would be like driving your car around with no engine oil, on purpose. Who ever did this, may have ruined the turbo. To be fair, it may have been toast before. Well, at least we had a good laugh at the shop. Well, that does it for another round of Shop Shots. I was wondering what you guys thing about the red highlights on the pictures? Is this something that works better than just a picture? Post you thoughts in the comments. Let me guess, the tire plug was on a mini-van filled with small children? Say what you want but the policy at our shop is that the tire fix will cost just about what a new tire costs. The safety part of this is one ting but in this sue happy world with an ambulance chasing attorney on every block it’s not worth it. I’ve seen that turbo oil bypass a few times on various vehicles. Some were legitimate excuses to just stop the oil burning and get home and then there were the ones that have been like that for years, “…a guy told me it would stop the oil burning and leak but then it made a loud noise and just doesn’t have the power it used to…” Yes people turbos need oil, clean oil too let me add, synthetic would be nice while I’m at it. Take that oil away and your lucky if all you get is toast, we tend to get hand-grenades. We’re all guilty of some questionable fixes and hopefully they have just been because nothing would work due to circumstances. That could be a great topic for a later piece someday, what was your most epic 911 fix?